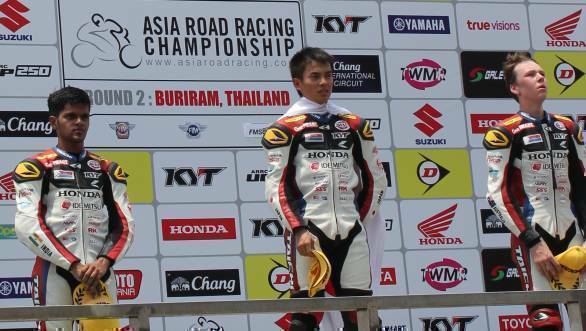 Indian rider Hari Krishnan managed to score his first podium finish at the second race of Round 2 of the Asia Dream Cup held at the Chang International Circuit in Buriram, Thailand. Krishnan finished in second position. He finished eleventh at the first race held the same weekend. His time in the second race, which saw him get his first international podium, was 16 minutes and 52 seconds. Krishnan is currently placed seventh in the overall championship standings with 32 points. 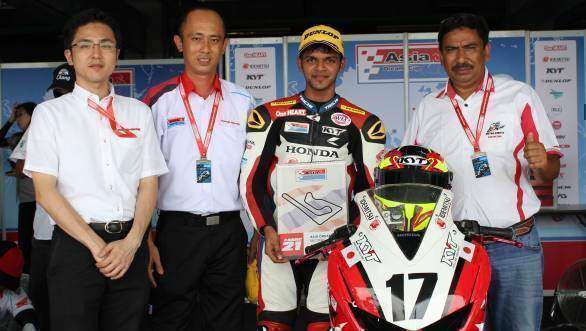 This makes him the second Indian racer after S Sarath Kumar to have scored a podium finish at the Asia Dream Cup. The Asia Dream Cup is a six-round motorcycle racing championship conducted by Honda, which is a part of the Asia Road Racing Championship. There are a total of 18 riders at the grid, racing on purpose-tuned CBR250Rs. Hari was a part of Honda's Ten10 Racing Academy in Bengaluru and was selected to represent India on an International level at the Honda One Make Championships. The next round in the Asia Dream Cup will be held on June 5 at the Suzuka Circuit in Japan. India is also going to be one of the destinations of the championship, with Round 5 taking place at the Buddh International Circuit between September 29 and October 2, 2016.